Several years ago, I realized that the essential movement patterns that I needed to train could be reduced to four categories of movement: open, close, push, pull. I discovered that as long as I touched base with these patterns consistently, I was ready for action. The foundational movements in my Firebreather Fitness training program represent one or more of these four basic patterns. “Open” refers to the ability of the ankle, knee, and hip to reach full extension— also known as triple extension. The majority of the skills we employ in the Firebreather plans have either an open quality to them in the context of triple extension, or a static contraction through these same joints. For example, in a squat, you reach triple extension and open the body, whereas in a push-up, you maintain a static contraction through the same joints. The ankle, knee, and hip remain isometrically in extension, while the upper body moves from a retracted to an extended position through the push-up. To “close” the body refers to a movement that dynamically shortens the line of axis from the chest to the hip. Two examples are the sit-up and the toes to bar progression. The body is closing, or folding, at the hip, under tension. Notice that from the top of the squat to the bottom position, there is also a closing element. However, I advocate choosing a specific range of motion that really accentuates the closing nature of the skill. To “push” with the body refers to any skill that extends an object away from the center of the body’s mass. For example, a push-up moves the body away from the floor at the moment of extension through the elbow, shoulder, and chest. A jerk or press moves a barbell away from the center of mass with an extension of the hip and arms, and the acceleration of weight overhead. Note that in some pushing movements, as in the push press, the hip and knee are involved, adding both a pushing and opening quality. To “pull” with the body refers to your ability to bring an object closer to your center of mass. For example, in a pull-up, from extension, you pull your body closer to the bar. 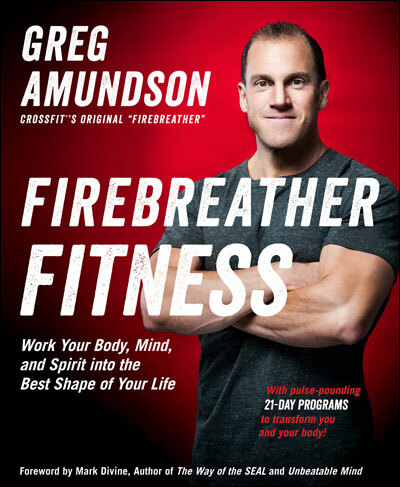 Many times, the compound multi-joint exercises you are asked to do in the Firebreather Fitness program blend various components of the open, close, push, and pull together. This is the beauty of the program, as it lends itself to quick gains in fitness.